I remember when I used to legitimately think that eating even a couple Brussel sprouts would kill me! The fear that a little onion or garlic might slip into my meal at a restaurant would consume my thoughts when I should have been enjoying the company I was eating with. After being on a strict SIBO specific diet (Low FODMAP and SCD combo) for about 4 months, my relationship with food was completely broken. What I could and could not eat was consuming my thoughts. I had to plan my meals very carefully, because the fear that I would react if I strayed was terrifying. My food fears were also supported by a lot of the misinformation in the SIBO webpages and forums. Most of the conversations are about “what foods need to be eliminated” and this often led me to restrict more foods to control my symptoms. The SIBO world seems to perpetuate the dangerous myth that the more restrictions in your diet, the better. As an overachiever, believing this myth led me down a destructive path that made me sicker mentally and physically. It took losing lots of weight, my GI symptoms worsening, my hormones going crazy, developing nutrient deficiencies and my stress levels going through the roof for me to realize that this diet was not the right fit. I needed a change!. But, the fears were deeply engrained. How was I going to add in new foods when my food fears were still so strong? I see this same dilemma with most of my clients. Food fears held me back and made my recovery longer than it should have been. I always want to help prevent others from making the same mistakes I did. In this post, I hope to shed light on how food fears can actually drive reactions to foods and I will also discuss some tips to overcome food fears. Dr. Bruce Lipton, a renowned cell biologist, wrote one of my favorite books of all time called Biology of Belief: Unleashing the Power of Consciousness, Matter and Miracles. In this epic book, Dr Lipton explains how all of the cells in our body are affected by our thoughts and beliefs. To sum this quote up: our thoughts/beliefs will effect the biology of your body. In the context of food fears, if you believe that you will react to a food, then your body will react poorly to that food. The dreaded lists of yes/no foods can change your thoughts/beliefs/perceptions about different foods. These beliefs are usually made stronger by the initial symptom relief that many experience when they start a restrictive diet. In addition, past experiences with reactions to fermentable fiber prior to treating the SIBO also reinforce the beliefs that you shouldn’t eat the “no” foods. Once these beliefs are reaffirmed by your experiences, it can be incredibly hard to break free from the beliefs that the “yes” foods are good and the “no” foods are bad. These beliefs can then actually drive whether your body will or will not react to foods. The misconception that restrictive diets are necessary to starve the SIBO can also strengthen beliefs and fears involving food. When in reality, you didn’t get the SIBO because of a problem with your diet. Instead, you developed SIBO because of a breakdown in motility and digestive function. Therefore, you can’t truly starve the SIBO with a restrictive SIBO diet. 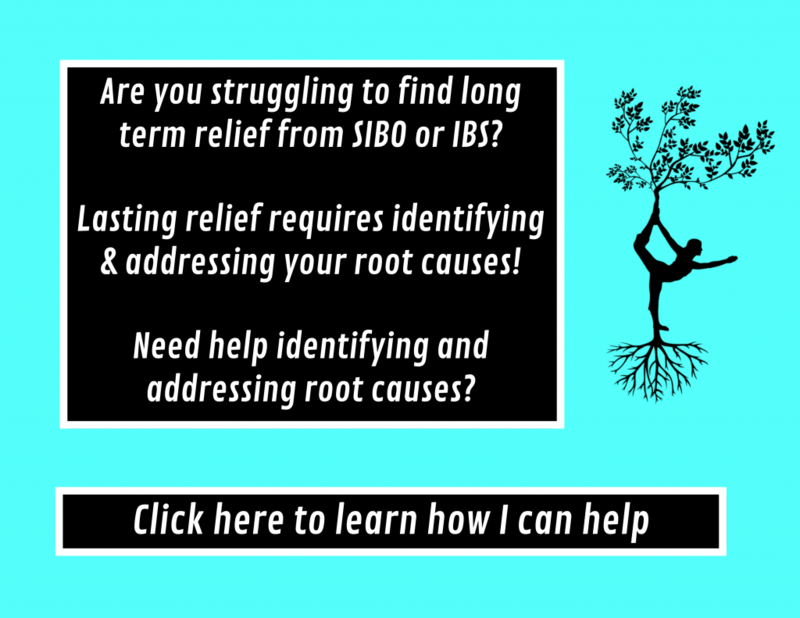 You have to beat the SIBO by addressing root causes. Your food fears will lead to anxiety and stress around “no” foods. This stress and anxiety can -cause reactions to the foods you fear. These continued reactions can reaffirm your food fears making them stronger and harder to break. Dr Lipton writes “human beings have a great capacity for sticking to false beliefs with great passion and tenacity.” This quote sums up food fears perfectly. Similar to my own experience with food fears, many of my clients have experienced a worsening of symptoms and health overall on these diets, yet they still struggle to break free from them (due to their false beliefs). “Our beliefs control our bodies, our minds and thus our lives,” Dr. Lipton writes. The key to changing how our body reacts to a food requires changing your beliefs. Clearing the SIBO and addressing root causes will help limit the reactions to foods. Like I mentioned before, a reaction to a food can create a negative feedback loop leading to avoidance. Even if you do have a reaction to a food, always remember that the food is not the problem. Rather, the breakdowns in digestion and motility are the REAL problem and your reactions to foods are just the symptom. Simply reminding yourself that you can’t starve SIBO by eliminating fermentable fibers will make it easier to add foods back in. If you have not progressed or even become worse on a restrictive diet, remind yourself that restricting didn’t work. You can even leave post-it notes around in your kitchen to remind you of this to recondition your beliefs. One of the big problems with restrictive diets is that they often lead to malnourishment. By trying to starve the overgrowth, you can certainly end up starving yourself, which makes it impossible to heal. I often suggest that patients visualize how foods will nourish their bodies prior to eating them. Looking up or thinking about health benefits of new additions prior to eating them can re-frame problem foods. By thinking of health benefits, you will be thinking of the positive benefits of the foods versus the food fears. Connecting with others at a meal can crowd out the food fears. If you are laughing and enjoying the company of others, you are not going to be as likely to be distracted by your food fears. Try to make it a priority to eat your meals with co-workers, friends and family. Conflicting dietary advice on SIBO forums and websites can often exacerbate food fears. Taking a break from actively looking for diet advice can be helpful for some with food fears. Quieting the noise can also help you hone in on what your body needs versus what someone is telling you it needs or doesn’t need. It is also important to keep in mind that many SIBO sufferers also have food fears. While SIBO support groups can provide some helpful tips and support, they can also fuel the food fears when many members (with disordered eating patterns or food fears themselves) warn you against the dangers of certain foods. Rituals before meals can also help quiet the noise. These practices can help you return to a state of rest and digest and ease anxiety/stress surrounding meal time. If you have struggled to break through food fears on your own, you may need to work with a professional to help you overcome your food fears. Working with a dietitian or even a therapist can help you overcome disordered eating patterns. Sometimes just having someone tell you that you should be eating more foods can really help change your beliefs. Your food fears can hinder your ability to make progress. Retraining your thoughts and beliefs is necessary to heal a broken relationship with food brought on by SIBO or other gut issues. Need some help to break through food fears and to find a diet that works for you instead of against you? Contact me to set up a free consult 20 minute consult with me to see if I make a good fit for your case. Next Next post: Got Die-Off? What it really means and how to avoid it! Thank you so much. I needed this today. I got rid of SIBO and was back to eating a varied diet. However I had one symptoms left, trapped gas in my chest in the evening. I found out that I have Histamine Intolerance and was told to go on an even stricter diet. I am going through a lot of anxiety and depression all over again. This happened to me last time. I continue to think I will never get beyond eating this limited diet. I need to reset my brain. Hi Michelle! I would dig a little bit deeper into the histamine issues before going super strict on a low histamine diet. Lots of time histamine levels being higher is again a symptom of another issue (cortisol dysregulation, large intestine imbalances, genetics, etc). So again, the histamine foods might not actually be the problem, but it still might be a good idea to remove the big offenders but you may be able to tolerate some mild levels of histamine in your diet. I hope that makes sense!